The greatest New Orleans spinal cord injury lawyers can tell you that your spine consists of 33 strong bones (vertebrae) and fluid-filled sacs of cartilage (discs), which connect to the skull, shoulders, ribs, hips, and legs; it is the center of your skeleton. The spine surrounds and protects your spinal cord, which is a bundle of nerves running from the base of your brain down through the open space in the vertebrae. The best Louisiana spinal cord injury attorneys know that your brain (the command center for your body) and spinal cord are part of your body’s nervous system. The spinal cord is the nerve pathway that carries signals back and forth between your body and your brain, and when your nervous system is working properly, transmits the impulses from your brain that control all voluntary and involuntary movement. The most common cause of spinal cord injury begins with a sudden, traumatic blow to the spine that breaks and squeezes the vertebrae, or the bones of the back. This, in turn, may displace bone fragments, disc material, or ligaments that bruise or tear into the spinal cord tissue or the nerves that carry signals back and forth between your body and your brain; cause central cord syndrome, which is damage to the spinal cord specifically confined to the corticospinal tracts of the cervical region; and lacerations caused by either external damage or by internal tearing or severing of nerve fibers. Less common causes of spinal cord injuries are various diseases acquired at birth or later in life, from tumors, electric shock, poisoning or loss of oxygen related to surgical or underwater mishaps. A spinal cord injury disrupts the signals and may impact the ability of your brain to send signals below the level of injury, resulting in either temporary or permanent loss of movement and/or feeling in the body. Spinal cord injuries can be complete or incomplete. In a complete injury, nerve damage obstructs all signals coming from the brain to the body below the injury causing loss of reflex function and sensation below the point of injury, or paralysis (the loss of the ability to control muscle movement). In particularly extreme cases, automatic activity such as bowel movements and bladder control may be effected. With an incomplete injury, you have some sensation and motor function below the level of injury. 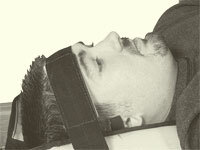 Over time, additional symptoms may develop from either a complete or incomplete spinal cord injury, including muscle spasms and exaggerated reflex activities, sexual dysfunction and changes in fertility, excessive sensitivity to stimulation, pain or intense stinging sensation, and difficulty breathing, coughing, or clearing secretions from your lungs. As though this wasn’t enough, patients with spinal cord injuries often suffer secondary medical conditions such as bed sores and infections in the bladder or lung. According to the National SCI Statistical Center, it is estimated that there are between 243,000 and 347,000 Americans living with spinal cord injuries, with over 17,000 new injuries occurring every year. The average age at injury is 42. Males account for approximately 80% of new spinal cord injuries. The leading causes of spinal cord injury vary by age. Among persons under age 65, most injuries to the spinal cord are caused by automobile and other motor vehicle accidents; and among persons over 65, most spinal cord injuries are caused by falls. Other common causes of spinal cord injury are workplace accidents, diving accidents, electric shock, construction accidents, bullet or stab wounds, extreme twisting of the trunk, sports injuries, or horseback riding injuries. Alcohol use is a factor in about 1 out of every 4 spinal cord injuries. A spinal cord injury can be an extremely traumatic experience that impacts every aspect of your life; however, the severity of the injury is not necessarily immediately apparent, even to a medical professional. In certain instances, conditions which are the direct result of the injury may emerge over the course of years or even decades; thus, injured persons require lifelong medical care for the injury. According to the National SCI Statistical Center, the average yearly expenses (health care costs and living expenses), and the estimated lifetime costs that are directly attributable to spinal cord injuries vary greatly based on education, neurological impairment, pre-injury employment history, and age at injury. The estimated lifetime costs range from $1,000,000.00 to $4,000,000.00 (not including indirect losses in wages, fringe benefits, and productivity). In order to ensure that you receive the necessary compensation for lifelong medical complications, it is essential to hire an attorney who is capable of understanding the many challenges you will face during your lifelong recovery. At our firm, we know your primary goal after suffering such a debilitating injury is simply to ensure that your medical and living expenses are covered, so that you can focus on your recovery. For additional information and options on how you might proceed next, contact one of our experienced attorneys and get the compensation you deserve.